We had a really quality continental breakfast at the Sterling Inn. Shortly after, Eric from the Inn shuttled us and a few other hikers back to the trail around 7:45am. 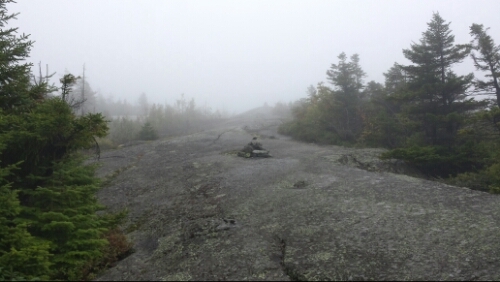 It was easy going trail for quite a while as it gently ascended to Pleasant Pond Mountain. I started to refer to this kind of normal and flat trail as “good Maine” vs. “evil Maine”, where the trail is gnarly and filled with crazy roots, rocks, and PUDS. The weather was holding out for the morning, although it was crazy humid and sweaty. We climbed Pleasant Pond Mountain and had some clouds coming in by the time we reached the summit. 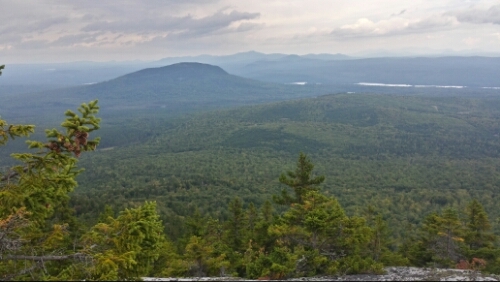 View North on Pleasant Pond Mountain. I think that's the Barren Mountain range out in the distance, one of our last. We descended and hiked for 5 miles or so more on evil Maine terrain to the south outlet of Moxie Pond, which was another supposed ford. Again though, the water was low enough for us to hop across the rocks without getting wet. We hiked on and the skies grew more ominous. We got to the Bald Mountain Lean-to and things looked really imminent for a storm, so we hustled under the shelter as it started to rain. I think this was the first time on our entire hike that we got lucky enough to be near a shelter just as it started to pour. We hung out and chatted with a south-bounder until it stopped 20 minutes later or so. We then climbed over Moxie Bald Mountain in a misty cloud. It was another fairly easy climb, with mostly good Maine going on. We hiked down to the Moxie Bald lean-to, which is on the Bald Mountain Pond, and found a tent site just off the pond. 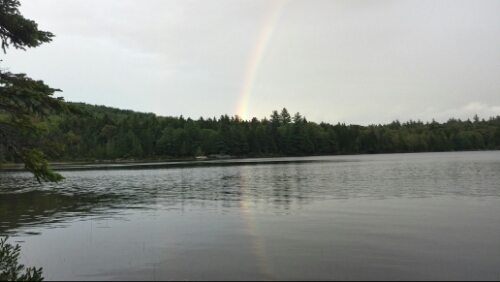 We had some light drizzle as we ate dinner under the tarp, but it blew out and a sweet (and almost double) rainbow popped out across the pond. The weather really cooled down, which is great for hiking tomorrow. We have around 17 miles into Monson, the last town on the trail. Wow. Your incredible daily progress and awesome experiences leave us practically speechless! Wow! 2052.9 miles on those feet! Wow! I wish I could say something more clever, but it’s so amazing I can only come up with “Wow!” Thank you, yet again, for the awesome photos. Love the rainbow! It’s a good sign of your upcoming success. Hang in there…hike strong (after your rest in Monson)! Sending double sneaker wings to take you through the rest of the trail…along with only-good-Maine-and-no-evil-Maine thoughts, many prayers and Maine-size ponds of love! Best song of the day yet. Luckily you only saw the final score. It was not a ‘I don’t have to pay attention too much to the game and can focus on my drinks’ kind of game. But Hail to the Lion! What a beautiful rainbow photo! Can’t believe you’re so close to the end if this amazing journey! Stay safe and have fun!